Am not sure why you can’t use ssh with webmin. I haven’t tried ssh with webmin though. As for the SSL certificate, was it saying that it wasn’t trusted? That is normal for your own server since you haven’t registered your certificate with a certificate body like comodo or diginotar. Accepting the certificate in your web browser is all you needed to login into your server. If it was something else, please share how you fixed it. no more Certificate error anymore. so i dont know what’s the problem !! The first time you go to https://YourServerIPAddress:10000/ajaxterm/proxy.cgi/10001/ you might be asked to login afresh into webmin. In that case, login and re-enter the url. the text login is working just fine for me, but SSH is not he only way to SSH is thru putty. Thanks again for your help on this … much appreciated. and keep up the best work. Welcome. We all need help once in a while from each other. i have another question for ya, i tried to build a Forum … but i could,’t find anything for Ubuntu or linux!! i have my server running FTP server and webserver installed and i want a forum template 😐 how to do that? For your needs, have a look at OSQA, phpBB and redmine stacks. The stacks are very easy to install. You’l be up and and running in a few minutes. Once you install, you can access the stacks via web interface from a remote computer. The installer will ask you for port numbers, a username and password. For example, when installing the mysql database for the Drupal stack, it will ask for the port for mysql (usually 3306) but since you have used port 3306 with your default mysql installation in linux, you can choose 3307 for the drupal stack. before we continue .. when you say stacks, what are you referring to? Also do I have to install mysql database for Forum or the template will choose the database automatically and install it. For a simple forum like PHPBB, how the users and information will be saved is it local on my mini server or online? Stacks (prepackaged software) like PHPBB, wordpress etc. Prepackaged int that it has all the software you need to run the service i.e phpbb. No you don’t have to install mysql database to use the stacks as they come self-contained. Mysql is in the stacks already. 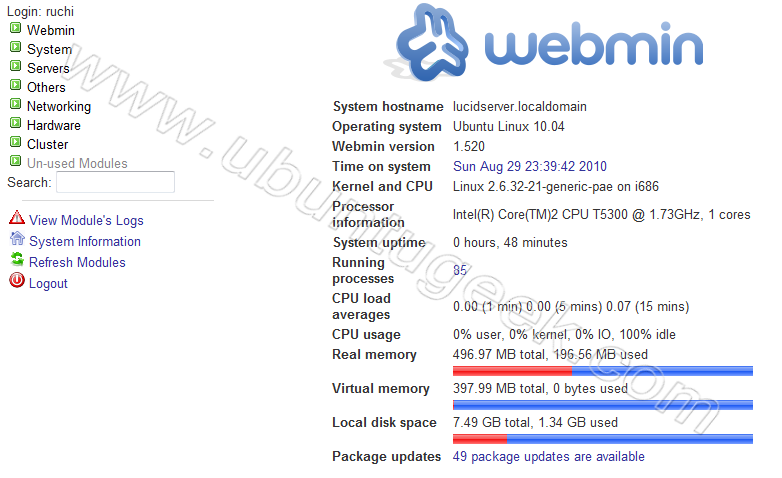 gotcha, now knowing that i already have a webserver ok? and if i install phpbb stock how couldi get to the forum?! i don’t have a DNS name i only use my IP and i get my website. i want when i type ip i get to my forum instead then i will put a link from there. Remember to open the port you choose for phpbb in your firewall. router fw or ubuntu fw ? Router forward. That is if you want people outside your network to access your forum. Alternatively if you have a firewall (like untangle) installed between your router and LAN, you can forward ports to your ubuntu server from the firewall. If your ubuntu server is your firewall, then just do router port forwarding. Consider registering for a domain name if you want your forum to be accessible from the public internet. everything work fine .. except for the myphpadmin … i coudn’t log in to it from a remote laptop !! it keep saying that i only can lig int to it from local ip (127.0.0.1) which i can’t because my mini server is CLI! please how do i install the gui as i tried it several times using the sudo apt-get install ubuntu-desktop but keep getting the message ”E:couldn’t find package ubuntu-desktop”. How do I download the package and install it. the corporate firewall will not allow me to access your site. I can do it from my window machine and move it across?? ?